My first wedding cake almost turned out disastrous. Baking began on Thursday; the first two layers were baked. Friday I baked the other layers including the groom's cake. I stayed up for 15 hours straight baking, icing and decorating. All cakes were made from scratch. The bride's cakes were a traditional white cake with white buttercreme frosting and the groom's cake was chocolate with red buttercreme frosting. I was so excited, very happy with the outcome. The cakes were placed in my car carefully for transport. I was on my way, about 15 minutes from the venue and whola I was bumped from behind and abruptly hit my brakes and my beautiful creations started flying everywhere. I cried and cried and cried. At that point, I did not care about my car, if I was okay; I was only worried about my cakes. To make a long story short, I arrived at the reception battered cakes and all, with my kit handy and I patched up the cakes as best I could. I have attached finished patched up cake w/o the bottom border border. It wasn't that noticeable until you took a photo of the cake and you can tell it was slanted. The groom's cake was smashed just a little. At the end of the day, the bride, groom, wedding planner and guest were okay with the outcome and the cakes tasted great, especially the chocolate groom's cake. I truly appreciate all the wonderful feedback regardless of the feedback presented. You guys are truly a pleasure to blog with and I appreciate you all. I bet myself up quite a bite about the wedding cake, but I am good now. Hi, Fellow Houstonian Cake Decorator! I live in H-Town, too. 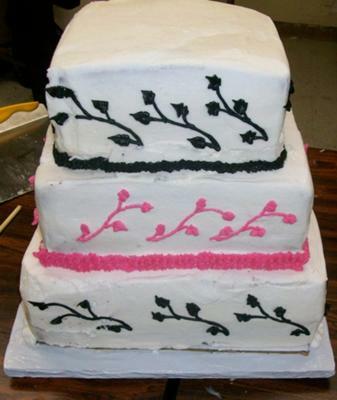 My cake decorating instructor says this is always the biggest feat, transporting the cake. She says she does not breathe until the cake is at its final destination! Good job remembering the repair kit. Nice job! I'm with Nancy. I'm scared to death of moving my 1st one! Mine will be my own cake next Nov. I'm so sorry that happened!!!!!!!! But what a cool head you have on your shoulders! And the cake is VERY, VERY pretty!!!!!! I'm proud of you! What a job! Wow!